"Learning Music Monthly is an album-a-month project. Each season of LMM lasts for twelve months and includes twelve issues. Every album features artwork by a different visual artist, and is released under a Creative Commons license. Every album from the series is available on this website for free stream or download. If you like what you hear, you can help us continue improving the project by making a small donation or purchasing a subscription to receive limited-edition, hand-made CDs every month in your mailbox." "All downloads are offered under a Creative Commons BY-NC-SA license. You are encouraged to share and remix as long as you give credit." According to this Creative Commons' tweet, the LMM site has been revamped. Not sure how it was like before but the current look and feel is really clean, intuitive and easy to navigate. When I visited the site, there were two seasons (i.e. 2 x 12 months) of albums posted. 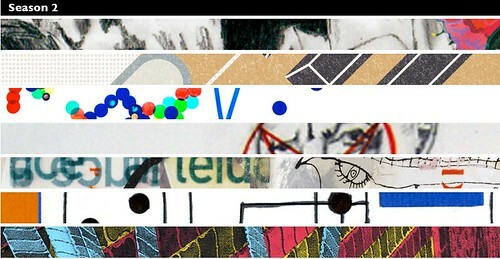 Each of the graphic bar represents an album. Clicking any bar would drop down the individual album playlist. 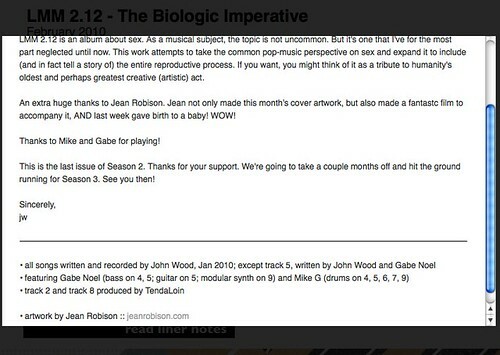 There's a "read liner notes" link, which will pop up more information about the album. The illustrator is credited in the liner note section. The one-album-a-month part is clear. I'm not that sure about the "learning" aspect though. The word learning made me expect that each album artist would share more insights on how they created their works. But most liner notes didn't go beyond listing the creators. But it's a great initiative, nonetheless. I'm not complaining or criticising. 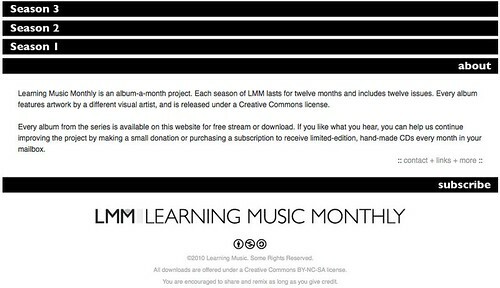 Suppose there was a Singapore equivalent of the LMM site, where there's a new track shared online monthly. Or a video (not limited to music). One of the requirement would be for the creator to provide information on the creative process. Could be a simple form to fill up, as a guide. And in the spirit of learning and sharing, the content would be licensed under Creative Commons. The main recurrent cost for such a site would be the hosting bills. Well, the alternative would be to upload the audio/ videos to Archive.org -- it's their mandate anyway. Then one has only to link to/ stream from the host site. Actually the maintenance cost isn't the biggest challenge. What's harder, I think, is in getting regular contributors for such a site. And getting them to understand and agree to releasing their works under a Creative Commons license. Wonder what our own National Arts Council (NAC) and Media Development Authority (MDA) would make of a site like LMM. Would they see such a website as part of what they want to promote with regards to media and arts in Singapore?